Apple's iOS10 update has ruined emoji. The Emoji Era Is Over. Thanks, Apple. Do you remember the first time you swiped through the original set of emoji? It was really weird, right? Because while they presumably served as one-tap word replacements, they were extremely unlikely everyday vocab candidates. Floppy disk. Fishcake. Space invader. Old-school mailboxes. Barely recognizable houseplant cactus. It was deliciously random. This was the joke we were all laughing at. This joke was the genetic mutation that helped the emoji organism flourish, conquer the world. If they’d simply been a set of pictures of common word-replacing images, the annoyingness of having to scroll through the entire set hunting for the right one would have precluded the one-tap efficiency, and rendered emoji superfluous altogether. But since they failed from day one, since they were always arbitrary, they transcended pragmatic-use demand, becoming more of a cultural fetish than a tool. Their names suggest that emoji were supposed to have fixed meanings. But most of them look nothing like their names: 😯, for example, is “Hushed Face Emoji” and 😤 is “Face With Look of Triumph.” Supposedly they make more intuitive sense in their home cultural context: Japan. Regardless, few people knew they had names anyway, and since they don’t look like those names to the average American, emoji effectively did not have fixed meanings. This was also a key to their success. Emoji were fun precisely because of the ambiguousness that rendered their meanings subjective. It allowed for interpretation in using them as signifiers. It made emoji a super creative semiotic game called “Hey, Guess What I Mean by This!” It allowed for that sometimes-baffling, sometimes-glorious moment on the receiving end wherein you either have no goddamn idea what someone meant or you totally do. But that has changed. The iOS 10 emoji are way too lifelike, literal, objectively interpretable, and well, way less weird. They made emojis prescriptive, in effect, quashing the possibility for play. This ambiguously angsty little man 🙇? Now pathetically apologetic. The silly dancing twins in leotards 👯 now have these weird slender bodies that aren’t nearly as cute or celebratory. The lady getting a head massage’s 💆 slack-jawed o-shaped mouth is now closed, cool, relaxed. The human characters got oblong, detailed faces. And their standard, creepy, maniacal grin👴? All but gone. Replaced with what looks more like Xanax-induced contentedness. Emoji function best as pragmatic gestures, not word replacements. When you meet people for the first time, you can hug them, shake their hand, politely nod, or kiss them on the cheek. None has a fixed meaning, but each sends a different set of signals, depending on their contexts. This is useful, because meeting someone, like most of life, is loaded with a lot of unknown factors and we need agility to both communicate and hide our thoughts and feelings as we please. A handshake, at its core, simply acknowledges meeting and establishes polite rapport with a possible degree of professional distance. We have freedom to adjust grip strength and number of ups-and-downs in hopes of sending more nuanced messages like perhaps “I’m not afraid of you.” Of course these signals get misinterpreted all the time, but their pliancy is a feature, not a bug. It doesn’t mean we should try to create a comprehensive system for them. That’s exactly what iOS 10 does to emoji—tries to fix something not broken. 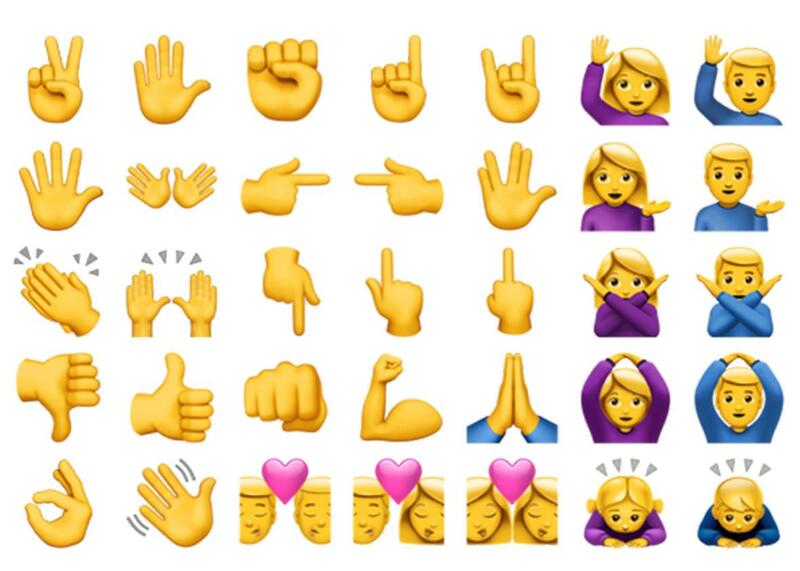 These new emoji leave no room for vaguery, interpretation, weirdness. And worse still, iOS 10’s emoji-suggest function now lets you tap a word to replace it with an emoji of Apple’s suggestion. No! That’s not it. Then emoji is just formulaic code. That’s the opposite of what emojis should be. That’s the iOS 0-fun version.